noted: Mind the Gap. Dupe find of the week! I've never bought anything from the Gap, if I'm honest pre-weightloss I wasn't sure there was much for me in there so didnt like to try. But I'm happy to say things have changed and I'm now devil-may-care about these things! Fast forward a week and I was in my local Sainsburys and on had a browse through the clothing aisles and spotted an amazing dupe of the Gap khakis. I'm lucky that my local store has a changing room (there's nothing worse than buying blind and having to take things back) so grabbed a pair to try on. 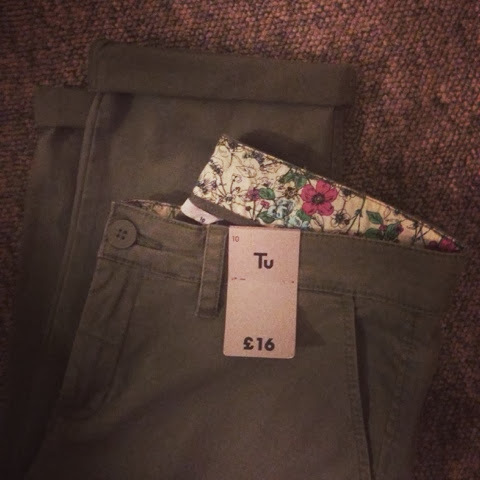 I'm happy to report that the fit and fabric of these are almost identical to the Gap ones and at half the price it'd rude not to! The only downside is that there isn't a selection of shades so the classic shade was the only option, but classic is good!